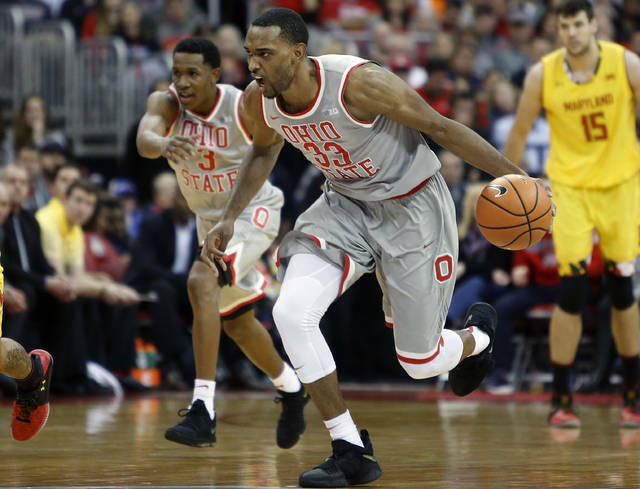 Ohio State’s Keita Bates-Diop is The Associated Press player of the year in the Big Ten Conference and the Buckeyes’ Chris Holtmann is its coach of the year. Bates-Diop and Purdue’s Carsen Edwards were unanimous picks to the AP All-Big Ten team also announced Wednesday, the first day of the conference tournament in New York. Michigan State freshman Jaren Jackson Jr. was picked as newcomer of the year and defensive player of the year in voting by 12 journalists who cover the league. Joining Bates-Diop and Edwards on the all-conference first team are Michigan State’s Miles Bridges, Wisconsin’s Ethan Happ and Penn State’s Tony Carr. Happ is a repeat first-team pick. Bridges was on the second team last year. Bates-Diop is second in the conference in scoring (19.2 points per game) and tied for second in rebounding (8.9 per game). The 6-foot-7, 235-pound junior’s 12 double-doubles are tied for second in the Big Ten. Edwards averages a team-leading 18.2 points for Purdue, has scored 10 or more points in 14 straight games and is averaging 23.1 points per game in February. The second team is made up of Purdue’s Vincent Edwards and Isaac Haas, Michigan’s Moritz Wagner, Nebraska’s James Palmer Jr., and Michigan State’s Cassius Winston. Jackson is the second straight Michigan State player to be named newcomer of the year, following Bridges. Jackson averages 11.4 points per game, and his 3.29 blocked shots per game ranks fourth nationally. His 102 blocks are a school record. 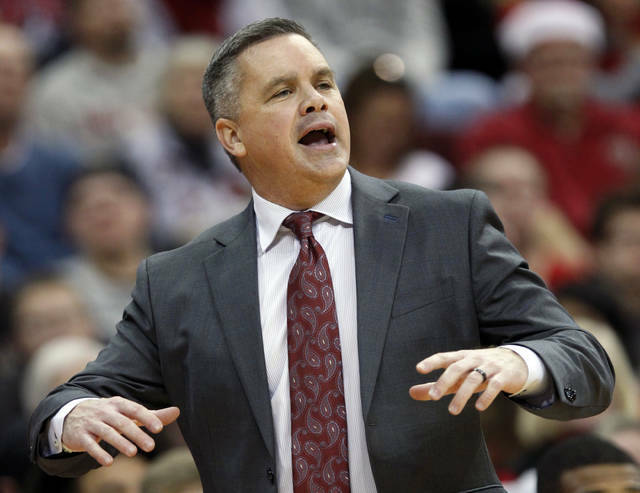 Holtmann, hired in June after spending the previous three years at Butler, took over a team that finished 11th in the Big Ten and returned just five players. The Buckeyes finished the regular season 24-7 and second in the conference at 15-3, more than double the number of Big Ten wins of a year ago. The 24 wins are the most by a first-year coach in program history, and the 15 league wins are the Buckeyes’ most since 2011.
u-Keita Bates-Diop, Ohio State, Jr., 6-7, 235, Normal, Illinois. Miles Bridges, Michigan State, So., 6-7, 225, Flint, Michigan. Ethan Happ, Wisconsin, Jr., 6-10, 235, Milan, Illinois. u-Carsen Edwards, Purdue, So., 6-1, 200, Atascocita, Texas. Tony Carr, Penn State, So., 6-5, 204, Philadelphia. Vincent Edwards, Purdue, Sr., 6-8, 225, Middletown, Ohio. Isaac Haas, Purdue, Sr., 7-2, 290, Hokes Bluff, Alabama. Moritz Wagner, Michigan, Jr., 6’11, 245, Berlin, Germany. James Palmer, Nebraska, Jr., 6-6, 210, Upper Marlboro, Maryland. Cassius Winston, Michigan State, So., 6-0, 185, Detroit. Coach of the year — Chris Holtmann, Ohio State. Player of the year — Keita Bates-Diop, Ohio State. Newcomer of the year — Jaren Jackson, Michigan State, Fr., 6-11, 242, Carmel, Indiana. Defensive player of the year — Jaren Jackson, Michigan State. 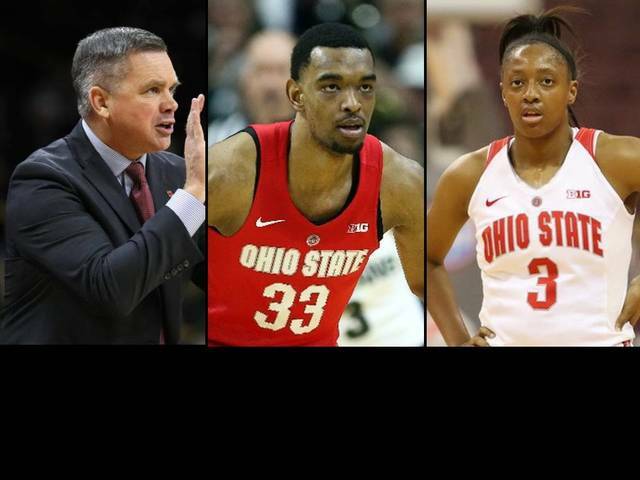 Congratulations to Ohio State Men’s Basketball Coach Chris Holtmann who was named Big Ten Coach of the Year, Keita Bates-Diop Big Ten Men’s Player of the Year, and Kelsey Mitchell Big Ten Women’s Player of the year. Yea Ohio! The Big Ten Conference unveiled the men’s basketball All-Conference teams and individual award winners on Monday night (Feb. 26, 2018) on BTN Live. A total of 16 students were selected to either of the All-Big Ten teams selected by the coaches and media, while another 14 students were awarded honorable mention status. The Big Ten also recognized 14 Sportsmanship Award honorees. The students chosen are individuals who have distinguished themselves through sportsmanship and ethical behavior. These students must also be in good academic standing and have demonstrated good citizenship outside of the sports-competition setting. The awards are voted on by conference coaches and a select media panel. The Big Ten Conference announced its 2017-18 women’s basketball all-conference teams and individual award recipients on Monday during BTN’s Women’s Sports Report. Ohio State’s Kelsey Mitchell was chosen as Big Ten Player of the Year by the conference coaches, while Iowa’s Megan Gustafson earned the Big Ten Player of the Year award from a select panel of Big Ten media members. It’s the third time in four years Mitchell has been the coaches’ choice for Player of the Year, while Gustafson becomes the first Iowa student to earn that honor from either the coaches or media since 1998, when Tangela Smith was chosen by both groups. Minnesota’s Destiny Pitts was named Big Ten Freshman of the Year by both the coaches and media, while Nebraska’s Amy Williams took home Coach of the Year accolades from her colleagues as well as the media. In addition, the Big Ten coaches selected Purdue’s Ae’Rianna Harris as Defensive Player of the Year and Maryland’s Ieshia Small as the Sixth Player of the Year. 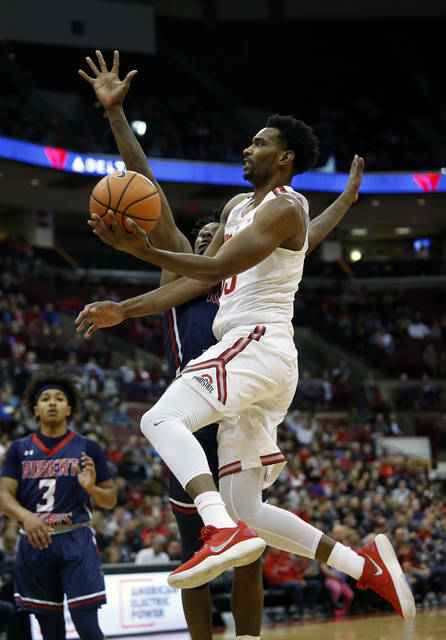 Mitchell led Ohio State to its 16th Big Ten Championship and second in a row, ranking second in the Big Ten and third in the nation in scoring (24.4 ppg. ), while leading the conference and ranking eighth nationally with 3.7 three-point field goals per game. A four-time Big Ten Player of the Week with a conference high-tying seven 30-point games this season, Mitchell holds the Big Ten records for career points (3,286 – also third in NCAA Division I history) and three-point field goals made (478 – also an NCAA all-division record), as well as the NCAA Division I record with her current streak of making a three-pointer in 87 consecutive games. Mitchell is one of seven Buckeye students to earn Big Ten Women’s Basketball Player of the Year honors from either the coaches or media, and the third three-time recipient along with Jessica Davenport (2005-07) and Jantel Lavender (2008-11). Gustafson helped Iowa to a tie for third place in the final Big Ten standings while earning Big Ten Player of the Week honors a record-setting nine times this season. She leads the nation in scoring (25.3 ppg.) and field-goal percentage (.667), while ranking second in double-doubles (26) and fifth in rebounding (12.8 rpg.). In addition, she tied Mitchell for the conference lead with seven 30-point games this year and has already set Iowa single-season school record for points (734) and rebounds (370). Pitts contributed to a Minnesota squad that also tied for third place in the conference standings this season. A seven-time Big Ten Freshman of the Week, Pitts is averaging 13.1 points and 7.4 rebounds per game with a .367 three-point field-goal percentage and 2.6 three-pointers made per game, ranking among the top 20 in the conference in all four categories. She is the fourth Golden Gopher chosen as Big Ten Freshman of the Year and first since Amanda Zahui B. in 2014. Williams was selected as Big Ten Coach of the Year after guiding Nebraska to a 20-9 record and a third-place Big Ten finish at 11-5, as her squad has recorded 13 more wins overall (eight more during conference play) than a season ago. Williams’ selection is the third time a Husker coach has earned Big Ten Coach of the Year plaudits since Nebraska joined the conference in 2011-12, with Connie Yori the most recent Husker recipient in 2013 and 2014 (both by the coaches only). Harris is the first Purdue student chosen as Big Ten Defensive Player of the Year honor since Lindsay Wisdom-Hylton in 2007. The Boilermaker sophomore is in a virtual tie for the Big Ten lead in blocked shots, ranking ninth nationally at 3.1 blocks per game. The Big Ten Co-Player of the Week on Nov. 20, she also ranks sixth in the conference in rebounding (8.8 rpg. ), while adding 12.4 points per game in helping Purdue to an 18-12 record and a 9-7 finish in Big Ten play. Small is the second Maryland student in three seasons to earn the Big Ten Sixth Player of the Year trophy, following Brene Moseley’s selection in 2016. Small has played an important role in the Terrapins’ 23-6 season and Big Ten runner-up finish at 12-4, coming off the bench in all 29 games and averaging 9.2 points and 3.8 rebounds per game. Mitchell and Gustafson joined Michigan Katelynn Flaherty as unanimous first-team selections by both the coaches and media. In addition, Indiana’s Tyra Buss was a unanimous first-team choice by the coaches and Minnesota’s Kenisha Bell was a unanimous first-team pick by the media. The conference’s All-Big Ten teams consist of 10 first-team honorees, 10 second-team selections and honorable mention choices. The Big Ten also recognized 14 Sportsmanship Award recipients. The students chosen are individuals who have distinguished themselves through sportsmanship and ethical behavior. These students must also be in good academic standing and have demonstrated good citizenship outside of the sports-competition setting. Cydnee Kinslow, Illinois; Amanda Cahill, Indiana; Hannah Stewart, Iowa; Kristen Confroy, Maryland; Jillian Dunston, Michigan; Lexi Gussert, Michigan State; Carlie Wagner, Minnesota; Emily Wood, Nebraska; Lydia Rohde, Northwestern; Asia Doss, Ohio State; Amari Carter, Penn State; Andreona Keys, Purdue; Khadaizha Sanders, Rutgers; Kendall Shaw, Wisconsin.